If you’re of the opinion that social networks (and the content shared on them) is just a load of noise – and your colleague bullied you into becoming a member here, let us calm some of those fears. Believe it or not, it’s not all selfies on Facebook, cat videos on YouTube and a plethora of Kardashians on Twitter. OK those things all exist, but peer a little closer and you’ll see it for what it really is. Justin Beiber, Oprah and Grumpy Cat aren’t the only ones using social media – your peers, thought leaders, potential new contacts, and your competitors are all out there – they’re just waiting for you to reach out and connect. Online networks (like Procurious) are the communication hubs of the future. Our lives are increasingly becoming more digital, we live and breathe the online space. Procurious, LinkedIn, and Twitter all make it stupidly easy to communicate with people you wouldn’t normally reach – think of it as the world’s biggest Filofax! Say you want to message the CPO of Glaxo Smith Klein, you don’t have her email on file but you CAN search Procurious. This isn’t the Dark Ages, instead take the initiative and reach out to her – make the connection. 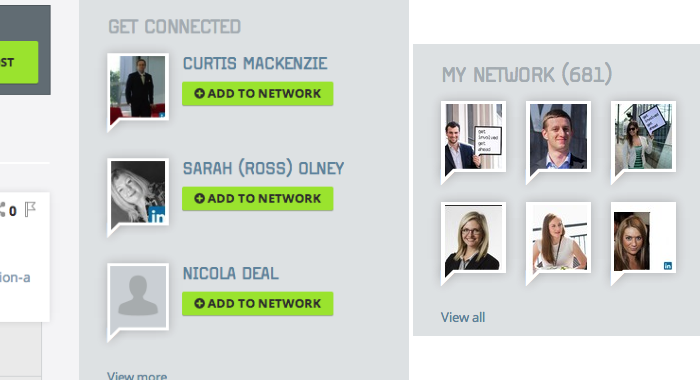 Take a look at your network – you can check this at any time by clicking on your profile picture and scrolling down to the ‘My Network’ area. There are a number of extremely ways to increase your standing: If you haven’t already, pay a visit to the ‘Build Your Network’ page (you’ll find it behind the green button, and it’s in the same place no matter which page you’re on). Here you can see who you’re already connected to, how you connected (via Procurious itself, or LinkedIn), and a handy selection of search filters that makes finding new friends a piece of cake. Don’t forget you can also invite existing connections from LinkedIn to join you on your Procurious pilgrimage. Click the blue invite button to select up to a maximum of 10 contacts per day. Email is another option (if your address book is bulging), or there’s the personal invite link that’s free to be pasted anywhere you like. Think Twitter, Facebook, and your Google+ page. While browsing Procurious you may have also noticed the ‘Get Connected’ area. This is our way of recommending other interesting members to you, just click the ‘Add To Network’ button to send a request to connect. With all of these tips, your network will be booming in no time!